I have been wanting to make one of these for some time now and I figured now would be a good as time as any, and they make a great gift. 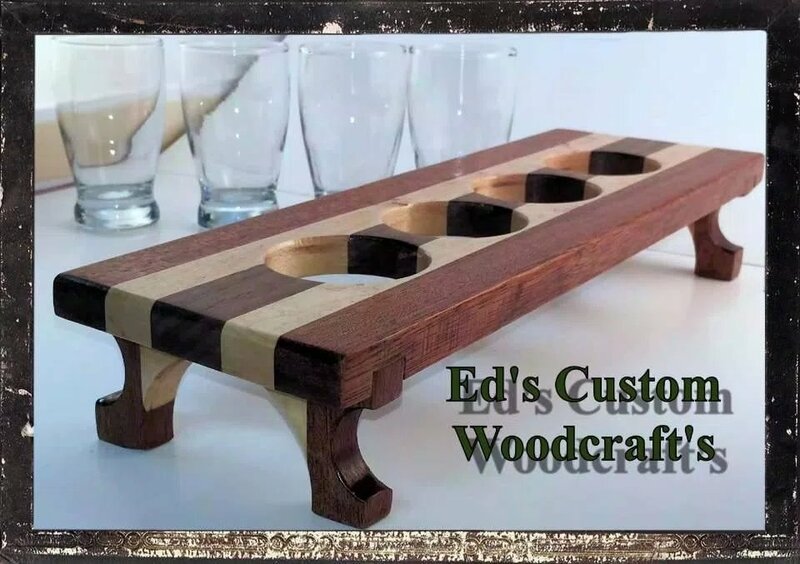 My last project was a success but to be honest I am a little worn out making Trivet’s but this is why I love woodworking as a hobby mostly because I can pick and choose what projects to make and when. In my spare time as rare as that is, I love frequenting local craft beer breweries and when I first went to one about 2 years ago I was amazed at the quality of beer that was being made in the same town that I live, love IPA’s. Anyway craft beer breweries rotate their selection very often and since they do that you are never sure which one to try next and that was when I introduced to my very first beer flight, which is usually a selection of beer samples that are usually 5 ounces and they also arrive on a wooden paddle that holds the beers in place, well that is what I am going to make. But this time was different I went to the lumber yard at Barney & Carey before I even designed a model. 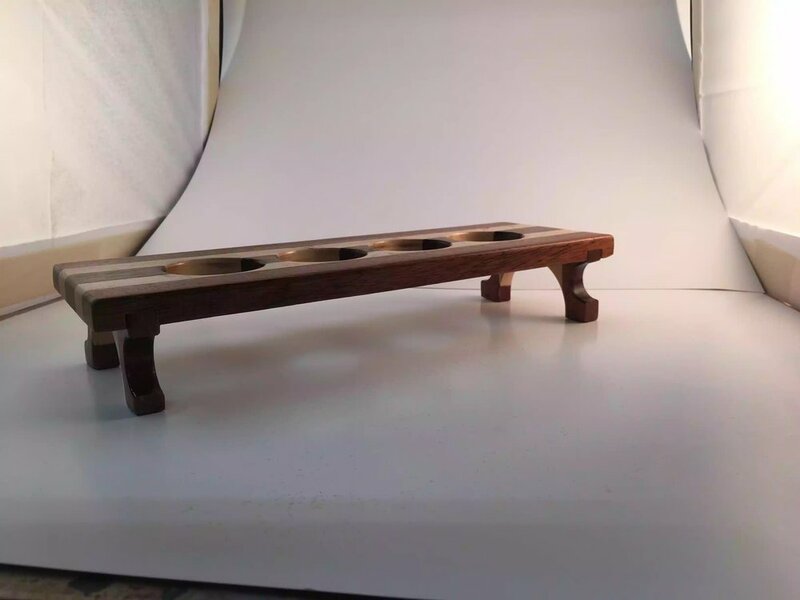 Some of the wood that I wanted to use was species that I never used before and therefore didn’t know how much this project was going to cost me, I am glad that I waited and I was also very surprised at how many great pieces of wood at an affordable rate I could get. I wanted to get 3 types of wood and they had to be contrasting species so that they would look great next to one another. So I eventually purchased Brazilian sapele, soft maple and walnut. Below you can see the woods that I purchased and I always sticker them for at least 24 hours so as that they acclimatize to my workshop. Here are the boards that I purchased at Barney & Carey lumber, the bottom 2 are maple, the next 2 up are Sapele and the top pieces are walnut. Here is the close-up of the lumber. 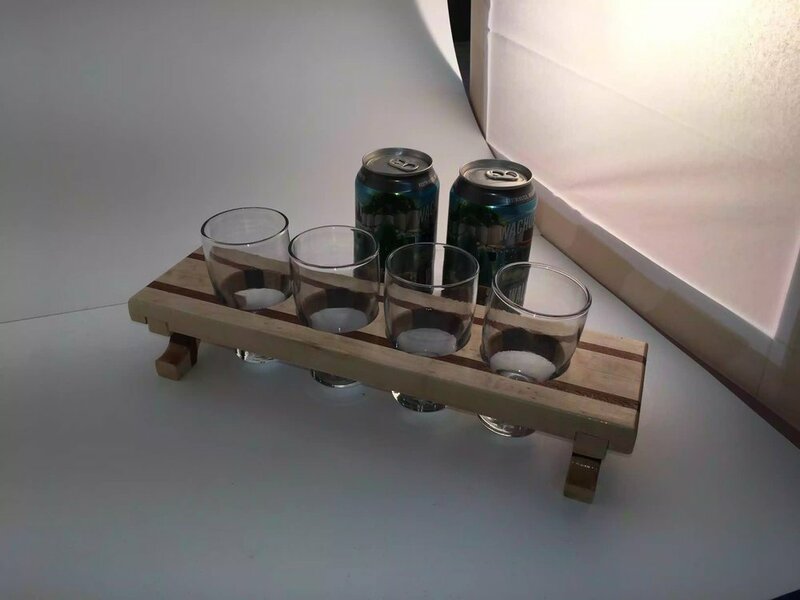 While doing some research I came across so many styles of beer flights, some were nothing more than pieces of pallet wood with a few holes drilled to have glasses just sit on them and some other styles were more elaborate that had a lot more work put into them, I decided to make one that had a lot of character to them, that is why I chose to use multiple contrasting species of wood. Wooden Flight will be made of sapele, walnut and maple woods. The woods will be cut into strips and arranged in a contrasting way so as to highlight the features of each wooden piece. 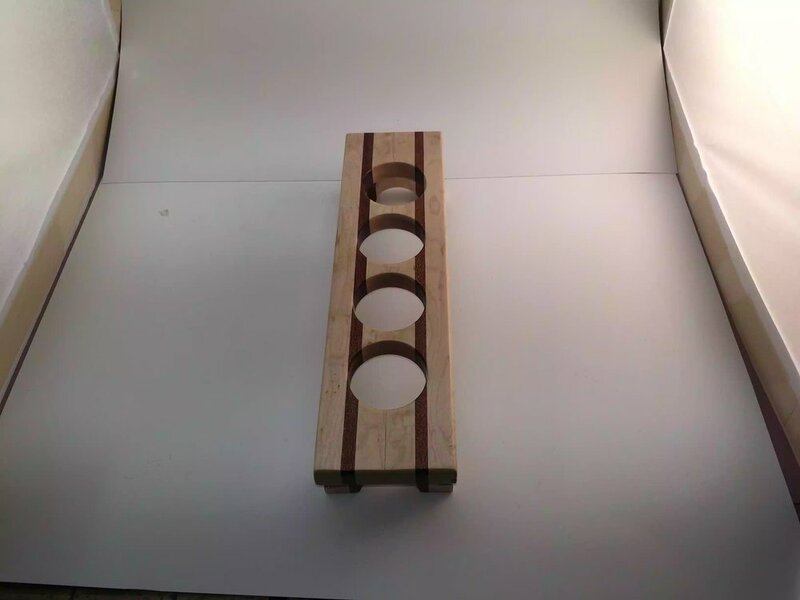 It will hold 4 sample glasses. It will be raised up so as that the glasses will be suspended within the flight. The top will have a round-over profile that will make it nice to the touch. The legs will also be made of the same contrasting style of woods so as that it blends with the top. I think the overall dimensions of the flight will be 13” x 4-1/2” x 2-3/4” high. I did some preliminary drawings on my 3D software and you can see them below, there might be some subtle changes to the overall design but it should look something like the below pictures. 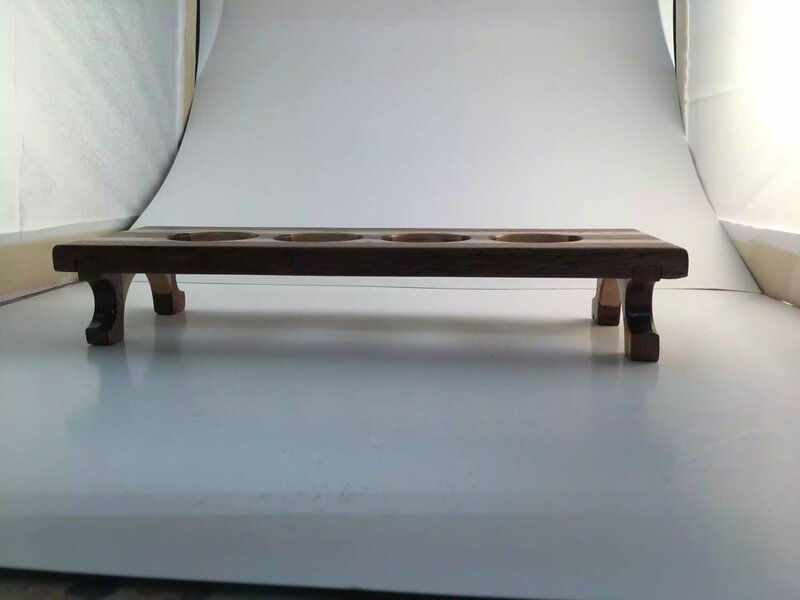 As you can see from the picture the feet will be housed in a groove beneath the flight itself which will provide a lot of stability for all the beer it will hold. This picture also demonstrates how the glasses will be held. 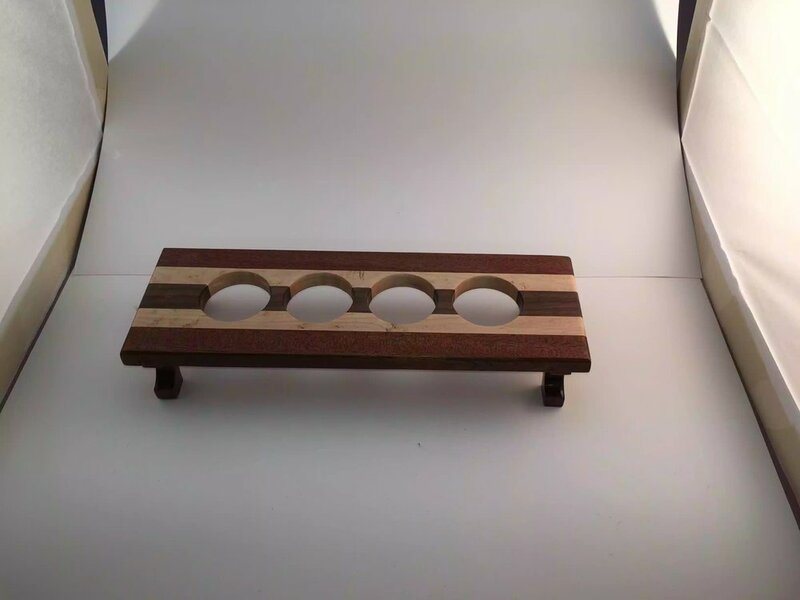 Here is another 3D image of the flight with the glasses removed, the wood colors are indicative of the actual wood I will be using, these images don’t have a grain pattern to them but trust me after its made it will look awesome. I will start making this project next week at some point and I will keep you posted as to all progress that I make.